The popular film Big featured a fortune telling machine with a cryptic gypsy named Zoltar. The Zoltar machine can be found all across America and, thanks to the film, has become a pop-culture favorite. 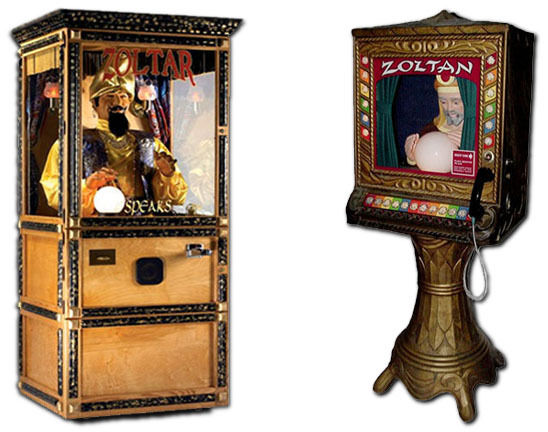 [The Zoltar machine is available for purchase online at this link.] This amusement staple is actually a modern revamping of the legendary Zoltan machine which was popular in the 1960s and 1970s. 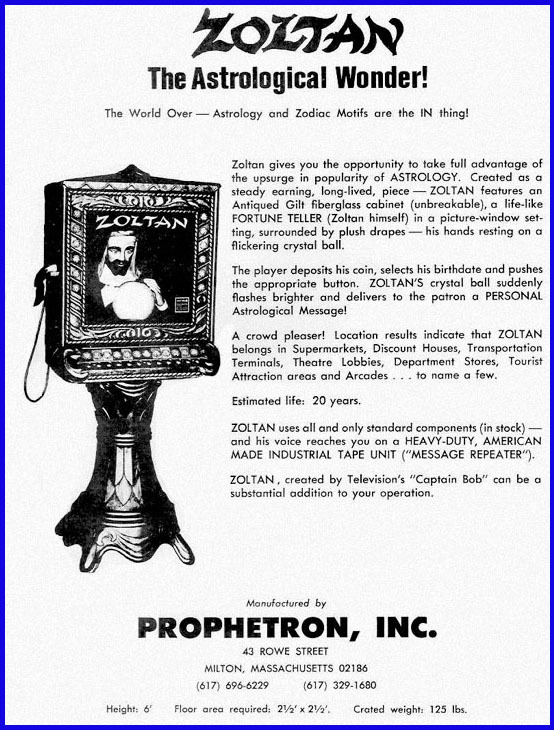 Zoltan fortune teller, Prophetron, 8/69 (but made from 1967 to the early 1970s), he does not move, but ball does light up and glow as fortune is read using a patron-held phone, endless loop tape cartridge by Bernard Cousino, fiberglass style body on an integrated pedestal stand. Deposit a dime and push one of twelve buttons on the front of the machine that correspond to the twelve signs of the zodiac, which are on a glass just above each button. All the buttons are wired in parallel, so pressing any button just starts the tape system, which has 14 different fortunes, all about one minute in length. The fortune plays and when done, a conductive tape on the tape loops closes a switch, which turns off the tape player… Zoltan’s crystal ball is lit by an eerie light. When one of the zodiac buttons is pushed, the crystal ball lights up brightly and illuminates Zoltans intriguing face. Then after a short pause, a somewhat mystical background music fades in and Zoltan begins speaking your fortune in a low voice with a heavy Hungarian accent. Zoltan usually starts out with ‘this is Zoltan speaking’ or ‘greetings from Zoltan’ and the predictions, which last about one minute and includes things about your future, lucky numbers, and favorable colors. Zoltan was a project done by Robert B. Bourque and Robert Cottle. 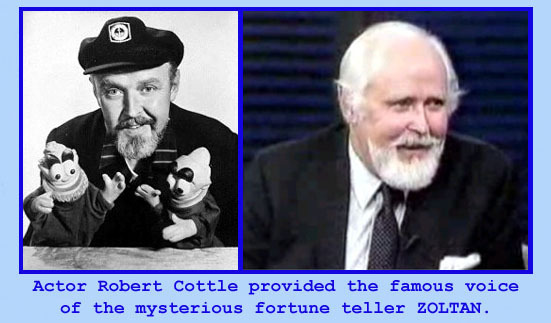 A lifelong friend of Robert Bourques was Mr. Cottle, who provided the deep voice heard on the machine. 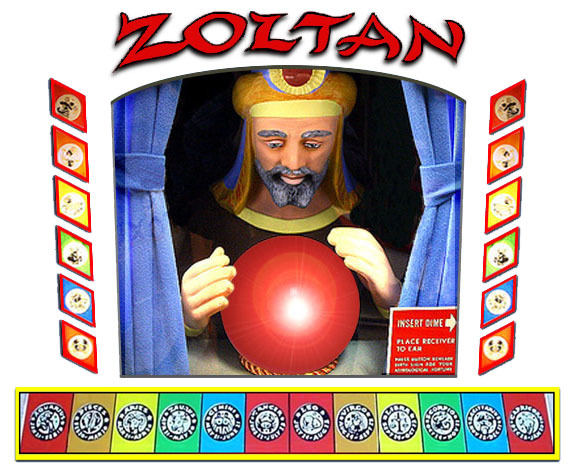 Unlike the modern Zoltar machine, the original Zoltan machine featured all 12 signs of the Zodiac. Zoltan offered fourteen different fortunes which played in the recorded loop as well as selected words of wisdom on various subjects. The Prophetron company was based in Massachusetts, on the opposite side of the country from the Zodiac’s hunting grounds in the state of California. The original advertisement listed several appropriate sites for the coin-operated Zoltan machine, including supermarkets, transportation terminals (such as bus stations and airports), arcades, department stores, theater lobbies, and tourist attractions. This advertisement indicates that the Prophetron company had marketed and possibly sold these machines to such buyers. If so, the Zoltan machines may have been all over the country in the late 1960s and during the time that the Zodiac adopted his curious greeting. CLICK HERE to hear to Zoltan’s fortunes. 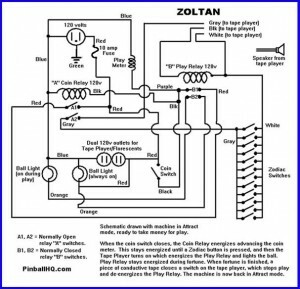 Click here to watch a video of the original Zoltan machine on YouTube.